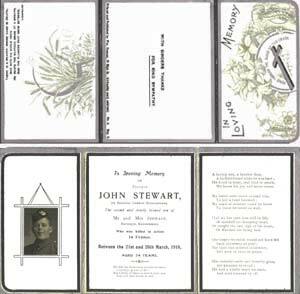 John Stewart, the second child of Peter and Isabella Stewart, was born on 24th October 1894 at Windseye, Kearn (Auchindoir) whilst his father was farming there. He had two brothers and a sister. 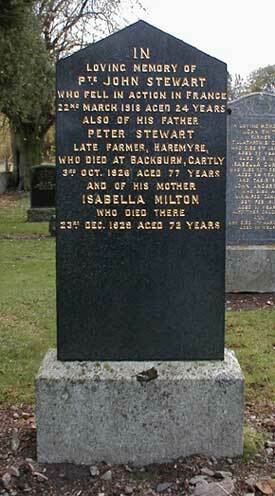 In 1895 Peter Stewart moved to Kennethmont becoming tenant in the larger farm of Haremyre on the Craighall Estate. John became a member of the Established Church in 1913. John enlisted in the 7th Battalion, Gordon Highlanders at Aberdeen, the letter ' s ' prefixing his serial number indicating a wartime enlistment in Scotland. It is not known if he volunteered early in the war or enlisted after May 1916 when universal conscription come into effect with a Military Service Act applying to all men regardless of marital status between 18 and 41 years. Working at home on the farm may have been classed as a ' reserved occupation ' prior to this date. 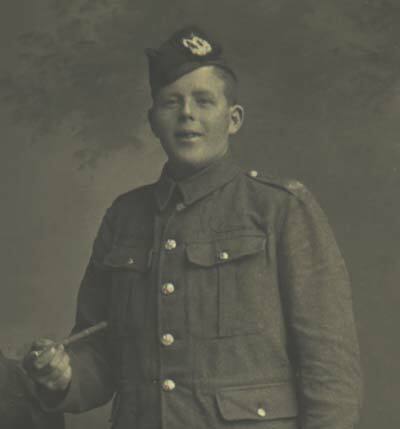 His elder brother Peter also saw service with The Gordon Highlanders during the Great War. 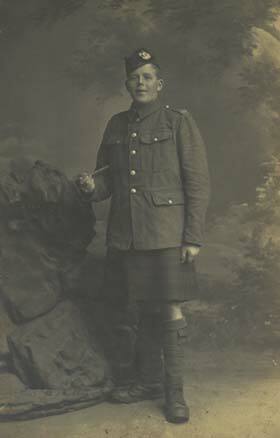 Although hospitalised for a time, due to the effects of gassing, he survived the conflict and went on to farm at Haremyre. The German High Command had carefully planned to launch a massive offensive, codenamed Operation Michael, from the Hindenburg defences in 1918. 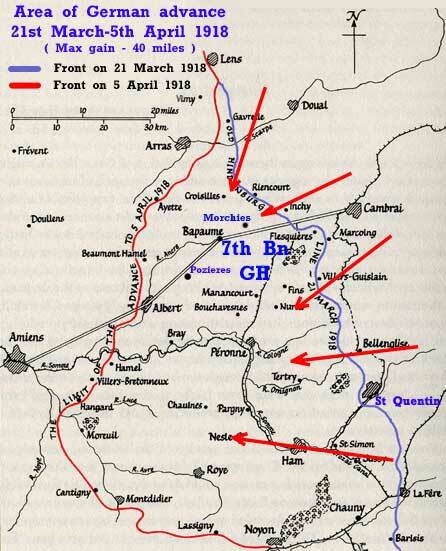 The Germans withdrew to these defensive positions in March / April 1917. When it became apparent late in 1917 that America would join the Allies, sending soldiers in great numbers, they decided to move at the beginning of the year when the worst of the winter weather had passed. 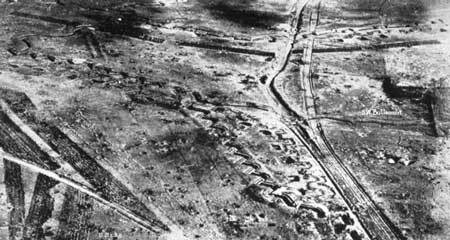 The Hindenburg Line, or Siegfried Stellung as they called it, was a vast system of defences in Northern France constructed by the Germans during the winter of 1916-17. It ran from a position east of Arras all the way to beyond St Quentin on the British sector, and consisted of deep and wide trenches, thick belts of barbed wire, concrete machine-gun positions, concrete bunkers, tunnels and command posts. It was considered virtually impregnable by the Germans. The British offensives during the summer of 1918 were to prove otherwise. John Stewart was killed in action during the The Battle of Saint Quentin ( 21st - 26th March ) at the beginning of The German Spring Offensive ( 21st March - 5th April 1918 ) when the Germans broke through the British front and overwhelmed the defenders. Following a short, intense bombardment, three German armies (70 divisions), 1700 artillery batteries, and 1000 aeroplanes struck along a 45-mile front near Arras. Within 48 hours, the Germans had penetrated 10 miles, the greatest single days advance on the Western Front since 1914. In just three weeks the German army overran over 1500 square miles of territory, including the former Somme battlefields, a gain unequalled since 1914, before they were finally halted on 5th April having pushed the front line back 40 miles. They failed, however, to reach their ultimate objective, Amiens, with its vital rail links to the Channel Ports, Paris and beyond. This ultimately meant that Germany could not win the war. 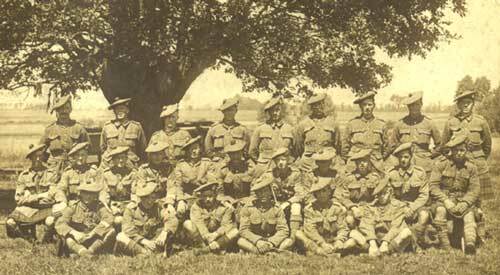 From the Battalion War Diary it is known that at the opening of this action 7GH in the 51st Highland Division were in Brigade Reserve at London Camp, Beugny to the south east of Arras. At 5.10am on 21st March the enemy began to shell Beugny heavily and it was observed that the whole of the forward area was being very heavily bombarded. The men were ordered to "Stand To" as, due to the large amount of enemy movement the previous day in and behind the enemies lines, a hostile attack appeared imminent. At about 6am orders were received to be ready to move forward at a moments notice. At 7.54am the battalion started to move, with few casualties, to the front line trench a mile further forward astride the Bapaume - Cambrai road between Morchies and Beaumetz. Enemy activity was observed all day and scouts seen close to the wire. It became quieter in the early evening and all companies were issued with rations. At 9.30pm a pocket of the enemy was discovered and driven out. It was relatively quiet during the night. The morning of John's death began with the ground covered in a thick mist, under cover of which, the enemy tried to cut the wire. When the fog lifted around 10.30am large numbers of the enemy were shot and further concentration was prevented by Machine Gun and Rifle Grenade fire. 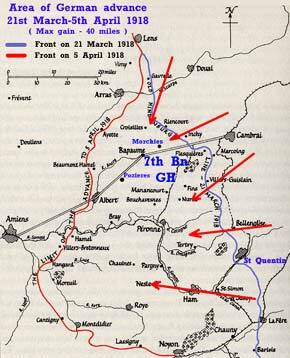 By 4pm the Germans had made four attempts to advance but on each occasion had been driven back with heavy losses. 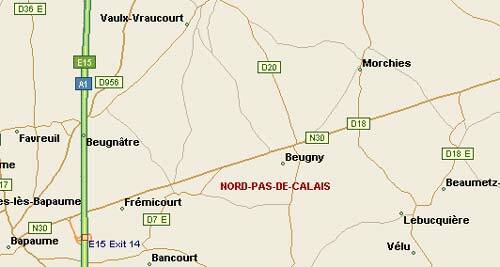 At 6pm another strong attack , assisted by 30 aeroplanes, broke through the line north of Morchies. At midnight the battalion were ordered to withdraw to Middlesex Camp ( 3 miles to the rear ) at Fremicourt. During the morning of 23rd March the remnants of the battalion collected there - 8 Officers and 100 Other Ranks. John has no known grave. His is one of the 35,000 names recorded on The Arras Memorial to the Missing. 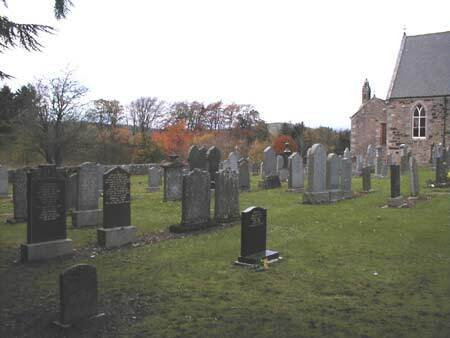 Three more men from Kennethmont fell in the same area and also have no known grave. Also recorded at Arras are John's neighbours Alexander Pirie from Braefolds and Robert Anderson from Mains of Craighall. Alex fell on 25th March, while serving with the 6th Gordons. Robert with the 1st Gordons fell on 17th June 1917. John Stewart wearing a standard Service Dress jacket rather than the usual one worn by highland regiments who were permitted to tailor them to accommodate the sporran. John Stewart, on the right, wearing a tailored SD jacket. 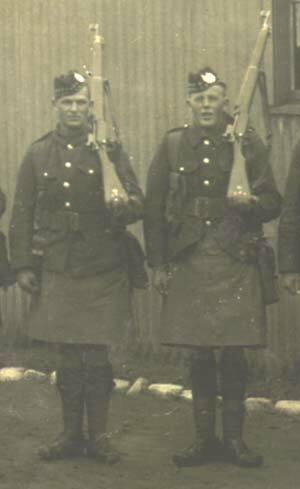 Both men are wearing the drab kilt apron. These served the dual purpose of camouflaging the kilt as well as helping keep the tartan clean. 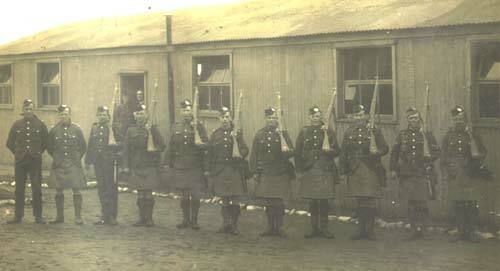 John Stewart (4th from right) and comrades shoulder their Lee Enfield rifles. This photo was probably taken outside an accommodation hut in a rest camp several miles behind the front line. The men would march from these hutted and tented camps or billets in the towns, "up the line" to the support trenches near the front ready to relieve those in the trenches. To minimise the risk from enemy snipers and artillery fire the final move forward into the front trench trench was usually carried out under cover of darkness. 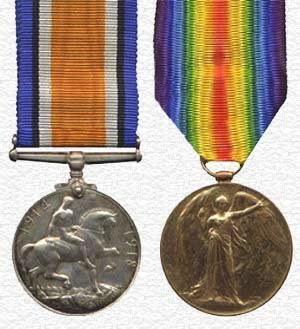 John Stewart was awarded these medals for serving his King and Country in The Great War. It was the practice of the time to commemorate a death on a Memorial or Death Card. The card on the left is tri-fold and double sided ( both sides shown). It bears a picture of John and details of his death and a verse. The exact date of his death, clearly, was not known to the family at the time as the card merely states he was killed in action between 21st and 26th March 1918, the period of the Battle of Saint Quentin.